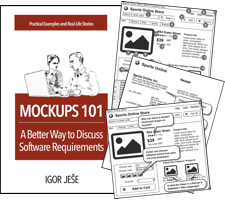 Below you can read the complete book "Mockups 101: A Better Way to Discuss Software Requirements" by Igor Ješe. If you have landed here without any prior context, you will probably want to learn more about the book first. Recommend it to your friends and mention the URL on social media. This helps a lot, thanks! Create links to http://www.Mockups101.com from your web page. Report any errors or problems you find. Consider buying a copy, paperback or e-book - it's more convenient for you, and it helps me create more material. Wait few seconds for the book to load. For best reading experience, use the "View Fullscreen" option. 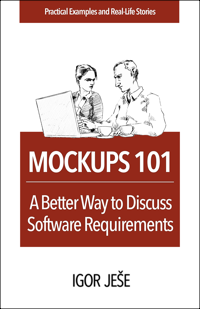 "Great simple straightforward approach to using mockups." Avoid common problems in various situations. "Instant productivity! It is so easy that I can prototype realtime in a meeting."